It's that time of year again: it's time when every store had a boatload of Easter candy. This year, we have some new things to try, so might as well crack them open just in time for the Easter Bunny to figure out what he's going to do this year. Lazy rabbit. We've got three on tap this time: Blue Raspberry, Party Cake, and MYSTERY CHICKS. I'm a sucker for Blue Raspberries. (Well, blue raspberry flavored things. I don't think I've ever had an actual blue raspberry.) So while I'm not a fan of Peeps, I figured this would at least balance things out. 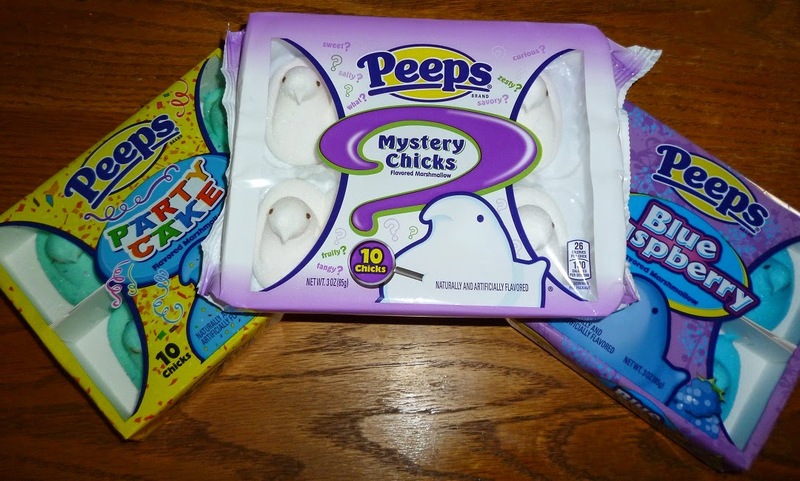 Thankfully, it did--this is one of the first flavors of Peeps I've ever had and not immediately regretted it afterwards. I actually voluntarily ate a second one! So, thumbs up for me. Next up was the Party Cake. I'm lukewarm on cake-flavored things; they're almost always too sweet and it's almost always better to just have a cake. But in this case, I thought maybe things were different. Sadly, not so much. While I appreciate the effort to put little sprinkles on the Peeps (well, coloring, anyway), the smell was actually not very good. Not bad, but just so strong and so overpowering it wasn't appetizing. And while it tasted OK (not great, but not overpowering like most are) the smell was a bit too much for me. Pass, but if you like this sort of thing (and probably don't mind the smell as much as I did) it's probably worth a try. Okay, let's get to the showstopper here: the MYSTERY CHICKS. The label says it all: who knows what flavor is inside of the package? The wrapper helpfully gives you some clues (Savory? Sweet? Fruity? Salty? Tangy?) and they are snow white and relatively odorless, so you have no idea what you're getting into. Oddly, I ate two of them, and it truly is a mystery: aside from a vague fruity taste, they were actually pretty weak and I have no idea what it was supposed to be. Zero idea. So the MYSTERY CHICKS will remain a mystery, at least to me. Now, I have no idea if different packages are different flavors--I don't think so, because you're supposed to submit what you think the flavor is to their web site. I'm not gonna cause I have no clue, and I'm not buying another package to test if they are different flavors or not. If y'all want to give it try, be my guest.